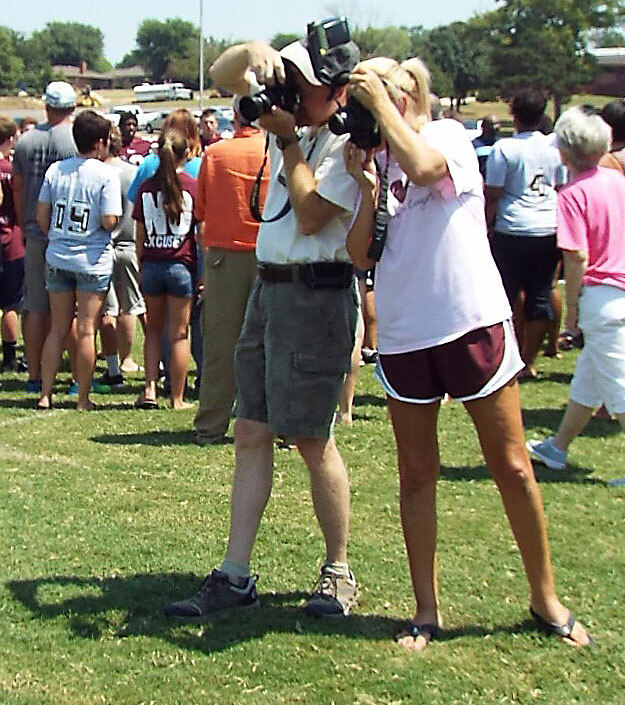 Putting our heads together: Ada City Schools teacher and part time photographer Jeanie Neal and I simultaneously shoot pictures of the coaches at Ada High School’s media day Saturday. She and I made a game of it to see if we could trip our shutters at exactly the same moment. It’s mid August, and our newspaper is doing what all newspapers do this time of year: working on our football preview section. It’s a pretty big deal in our community, since the schools in our coverage area have long and storied Friday Night Lights histories. One thing we do for the football preview is what we call “media day.” Parents, teachers and students know it as picture day or photo day, and it involves getting the entire football team for each school dressed out and lined up for a group photo, head shots, senior photos, coach groups, and feature images. Honestly, it doesn’t challenge me photographically, but I understand its importance to my newspaper and our community. We cover seven high schools and a college, so I probably photograph close to 400 kids each year. In the film days, that meant shooting a lot of film, and souping and printing it all, but these days, digital has powerfully streamlined the process. Also in the film era, I shot these media days using two cameras and a camera bag with loads of film in it; big, heavy cameras and lenses. I was younger then. I am 52 now, and every chance I get, I lighten my load. My neck, shoulders and back are telling me more than ever to take care of them. 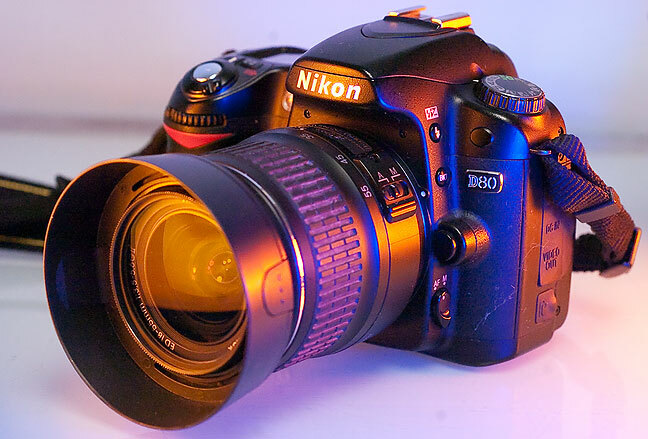 My go-to camera/lens combo for media days is a Nikon D80 with an 18-55mm “kit” lens. It is smaller and lighter than anything else I have, and still gives me the color and sharpness I need. The lens isn’t exactly a performer, but I don’t really demand much of it, since these media days are in bright daylight. I guess if you added up around 400 kids by 27 seasons, you get 10,000 or more players. That’s a lot of kids. The work of photographing them can seem mundane and tiresome at times, but I am happy to do it when I remind myself that I am making memories and recording history. The Nikon D80 and the ubiquitous 18-55mm “kit” lens is a small, lightweight solution to shooting our area football media day photos. Interesting to read your comments on the kit lens and a good reminder that it can be as useful as anything else in the bag. I never had to do the football preview sections in the film days, and I’m grateful for that.